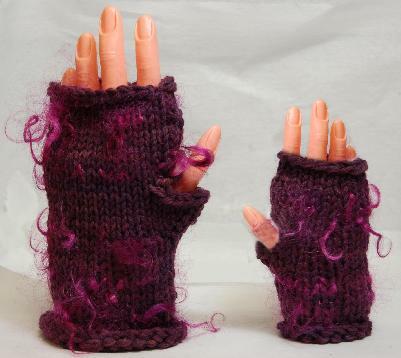 Super fast and super fun for yourself or as a mother and daughter set, these fingerless mitts work up quickly using Ivy Brambles Worsted yarn (doubled), one skein and a few curly locks will make two pairs of gloves, or one adult pair and matching ones for the children! Ivy Brambles Superwash Worsted Yarn #113 Wild BlackberryIvy Brambles Superwash Worsted Yarn is a deliciously soft hand dyed worsted weight yarn that is machine washable (cool) and dryable (low heat) designed for sweaters, baby garments and accessories desiring a worsted yarn. This is truly a spectacular yarn!